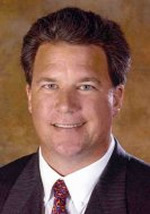 H. Wayne Huizenga, Jr. is the President of Huizenga Holdings, Inc., a diversified company that manages and owns the Miami Dolphins of the National Football League and Dolphins Stadium in South Florida as well as investments in banking, resorts, marinas, yacht refit and construction, real estate and outdoor advertising. He graduated from the University of Tampa with a degree in business in 1985 and has assisted his father, Wayne Huizenga, Sr., in his business ventures. Wayne, Sr., the only person in history to build three Fortune 500 companies in Waste Management, Blockbuster Entertainment and AutoNation, and be responsible for six companies listed on the New York Stock Exchange, was recently named World Entrepreneur of the Year for 2005 by Ernst & Young. In addition, as owner of the Florida Marlins, he won the 2003 World Series. Wayne, Jr. married his childhood sweetheart, Fonda Hix, in 1991. They have four children: Savannah, Tres (Wayne, III), Gerritt and Ainsley. He is a founding board member of the Bank of Florida. He is actively involved in Vida Nueva Ministries, a Christian outreach ministry addressing the needs of the underserved in rural Mexico. He is also a member of the board for the Luis Palau Evangelistic Association and honorary chairman for the Souper Bowl of Caring. Wayne, Jr. and his family regularly attend Calvary Chapel in Fort Lauderdale. Wayne Huizenga "Mark Christopher Story "
© Real Estate Prayer Breakfast. All Rights Reserved.